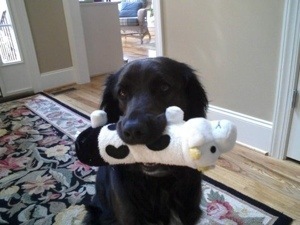 Meet Sam. 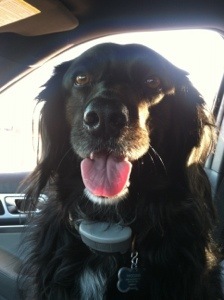 She is what they call in the canine world as a black dog. 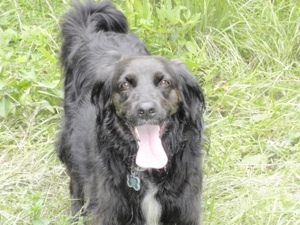 We adopted her as a puppy 7 years ago from the animal shelter. 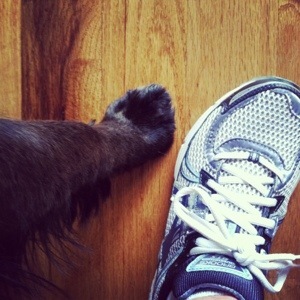 She’s my buddy. 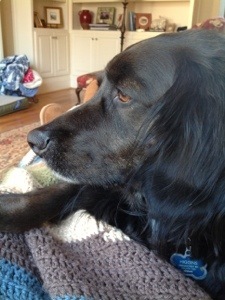 My pal. 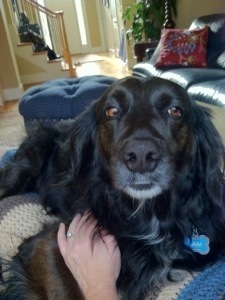 My sweet girl. She’s pretty easy to please. A little scratch behind her ear goes a long way. 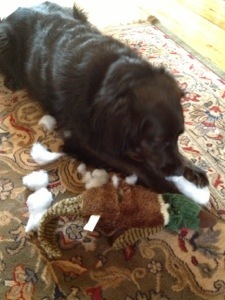 She’s a protector of all things dangerous, like this scary stuffed duck. And nurturing at the same time. 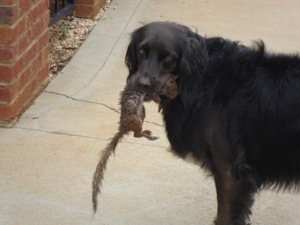 Yes, this squirrel is dead, but Sam gently carried it around for a few days, licking it and keeping it out of harms way by burying it under the mulch and digging it out again. 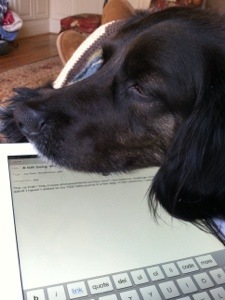 Sam helps me write my blog posts. 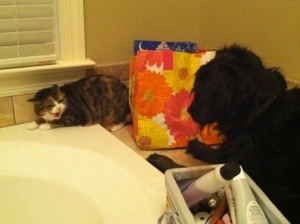 Unfortunately, Lilly Kitty doesn’t always appreciate Sam’s friendly nature. 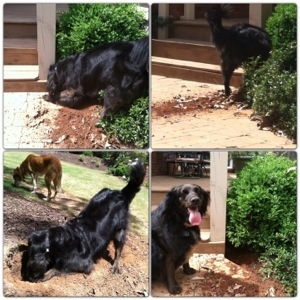 She’s determined to rid the yard of varmints. 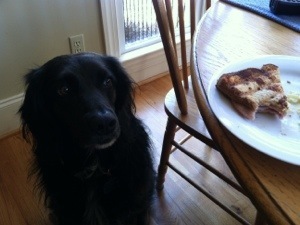 Sam has a wide range of food tastes, varying from kitty’s poop (you know, crunchy on the outside and smooth on the inside…) to garbage to your sandwich and even dog food. Another job of hers is to take and pick up the boys from school. 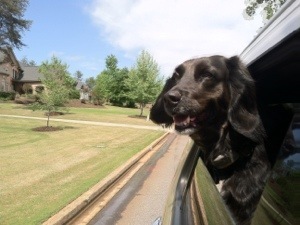 Car rides are one of her favorite things to do. 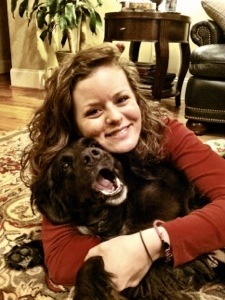 When Sister comes home from college, life is just that much better. 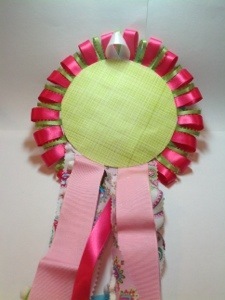 I’ve been noticing these rosette ribbon badges around the Internet. 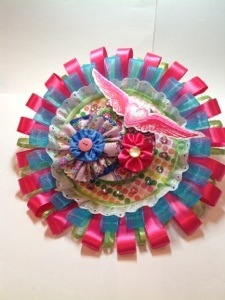 In fact, I had to buy the book, Rosette Art, by Cathe Holden. Immediately I had to make a prize ribbon for someone. Luckily, a friend of mine is going to be celebrating her birthday in a week or so. I think I might put this on her office door and surprise her. What I love about this craft, is that if you are like me, with LOTS of craft supplies, bits of this and that, this will help take care of that stash. So let’s begin with a cardboard base. A cereal box would be perfect to cut a circle out of. 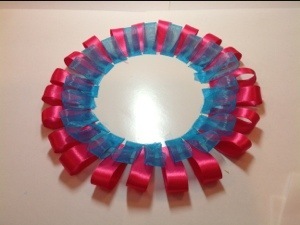 I measured and cut 5″ pieces of pink ribbon, which I folded over and glued around the circle. I filled the spaces around with blue and green ribbons in the same manner. 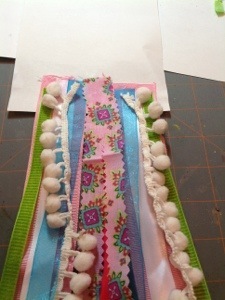 A little eyelet trim to cover the ribbon ends. 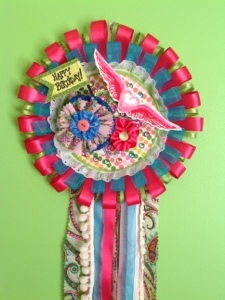 I covered an empty ribbon spool with fabric to add some dimension. 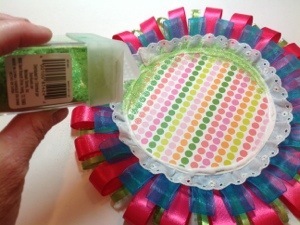 A canning jar lid is covered with glitter tape. I used some pink glitter tape to jazz up the heart wings. 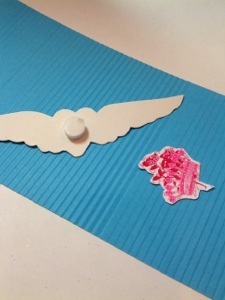 Foam dots will raise the wings up. Dag-gummit! I can’t find the crown in all this mess! Ugh! 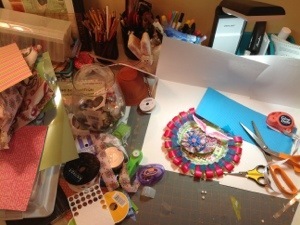 Does your work area get as messy as this? 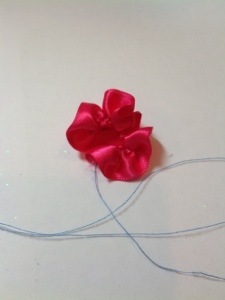 To make ribbon flowers, sew a running stitch along the long edge of the ribbon. 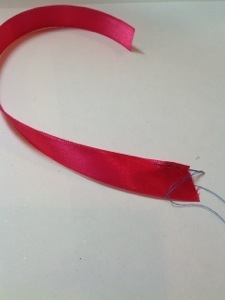 Pull the thread to gather the ribbon into a circle. 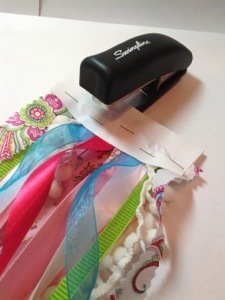 Sew closed. Add a button to make center of flower. For the tail, I cut several different ribbons, trims and fabric. 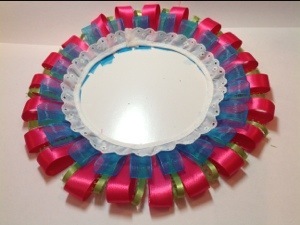 I glued them to a piece of paper, which I folded over to make it easier to attach to the rosette. I wasn’t too sure about the glue holding, so I stapled it shut. Not worried about the staples showing, because I glued another piece of paper on top. Don’t forget the hanger! I already have another idea for another friend of mine. 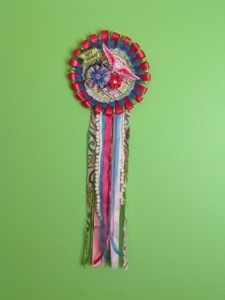 These rosettes are reminders of the county fair First Place Ribbons. They are given to the best pie, the number one cow and the finest quilt. 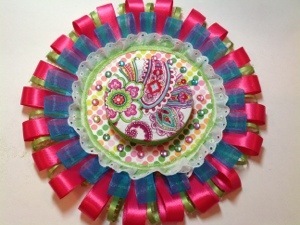 Hopefully, the people I make these rosettes for will know what special friends they are to me.